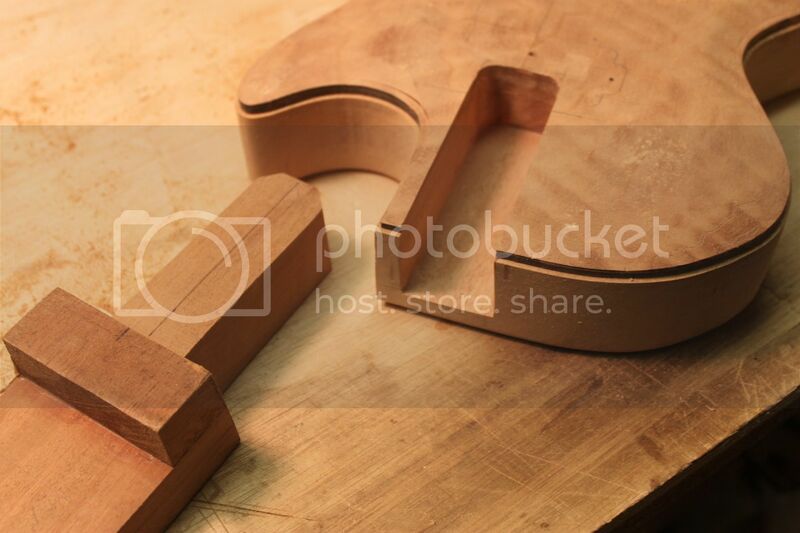 I'm about to build a Thinline style guitar, and I'm wondering about what glue I should use for creating the blank. I feel like someone is playing a prank on me that this info is so hard to find, or maybe I'm just refusing to see the truth. The most common recommendation I see for electric guitars is Titebond Original. Here's where I hit a mental block though. According to this article from Frank Ford, Titebond fails at a lower temperature (8 min at 200 °F) than hot hide glue. A friend who was definitely not me (why would you even ask that, of course I've never done this) used to leave his USA-made Strat in a hatchback in Texas in the summer, and the body of the Strat has never fallen apart, or even slightly hinted at any joint separation. That makes me think maybe Fender uses something with a higher temp range. Norland's High Tack Fish Glue claims a temp range of -30 °F to +500 °F. Would this be a better bet? Am I way overthinking this? I've also thought briefly about epoxy, but haven't looked into it especially far. My one last thought regarding HHG/fish glue is that everyone talks about how rock-hard it dries. How does it machine? 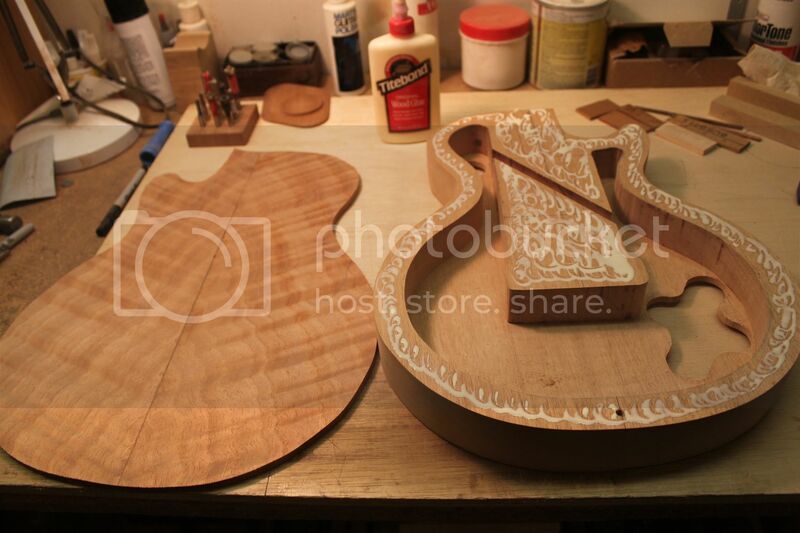 Since this will be a semi-hollowbody, I'll probably end up routing through the glue joint at some point. Would this cause any issue with a router bit, especially going from wood to glue? Lots of great guitars have been built with both Titebond Original and hot hide glue (HHG). Yes, testing has shown that HHG has a bit higher heat tolerance than Titebond but you really should never leave a guitar in a hot car unless you like to support your local repairman. I work on a lot of toasted guitars. Hot hide glue does not cause any issues with machining. The glue in a proper joint is only molecules thick anyways. You should not be machining into a big blob of glue no matter what. But using HHG for the first time is risky. You have to work really fast or the glue will go into the gel state and your joint will fail. Wait until later to learn how to use HHG. At this point there is a steep learning curve and you really should eliminate further complications. Titebond is easy and forgiving and makes strong joints. If you are building a semi-hollow guitar anyway, most of your routing will be in each half not necessarily across the glue joint. I like to leave some wood in the lower bout for balance anyway, so I don't rout across the glue joint. And if you are, like Barry said it's no big deal. Jointing the body halves must be exact along the joint, so the glue is very thin. Titebond when cured is not as hard as HHG, so should not cause (and has never caused me) any machining problems. In fact, I've never hesitated to machine through any glue line - epoxy, white glue, HHG, CA, veneer cold-press adhesives. Note that many products such as particleboard, hardboard, MDF, plywood - even phenolic - have huge amounts of glue or resin holding the filler together, and machine just fine. They do take a toll on tool cutting edges over time, but glue lines are so minimal as to be no concern re machining or tool wear. I can't imagine a reason not to use Titebond Original, or in fact any quality aliphatic resin glue, to glue up a solid body blank. It might interest you to know that the maximum service temperature of many common epoxies is 160 degrees farenheit, and it starts to degrade around 115 degrees. As an aside, I honestly would have thought that a USA made strat body would be one piece. I use HHG for joints that I know I will want to take apart someday in the future - mainly dovetail necks and fretboard extensions. I know that injecting steam into AR will probably release it, but HHG will for sure. I'll also say that my building chops with HHG are not good enough that I feel confident using it for any joint where I will need to fiddle around with alignment and clamping. Oh, it has a set neck also glued with AR, I hope to never have to take it apart. I've never had issue with Titebond original either. I've even used high quality cyanoacrylate to glue a top to a body and had no problems at all. Only get the good stuff though, from a true hobby (model airplane) style shop, and not the crud from hardware stores. When that stuff first got popular I guess my grandfather would get large quantities of it for furniture making, I think maybe starting in the '70s or so. Must have smelled terrible in that quantity. I use Titebond original for just about everything except neck resets on vintage instruments of value to avoid being cursed by some luthier 30 years from now. I've never had a failure. If someone puts an instrument into the hot trunk of a car, I have no compassion. Treat a musical instrument just as you would treat a puppy. Cruel people gotta pay me for work and I show no mercy. I think I kind figured Titebond was the right choice, I just needed someone to explicitly tell me it's fine. When I was asking about machining the glue, I was thinking more along the lines of going from (relatively) soft wood to "glass hard" hide glue could result in a router not behaving as desired. Sounds like it's a non-issue. Barry Daniels wrote: ...you really should never leave a guitar in a hot car unless you like to support your local repairman. Thankfully I'm very good about that these days, but I've learned my lesson. Brian Evans wrote: It might interest you to know that the maximum service temperature of many common epoxies is 160 degrees farenheit, and it starts to degrade around 115 degrees. As an aside, I honestly would have thought that a USA made strat body would be one piece. To be honest, I can't say for certain that it's not one piece. Some reason I thought the story was that Leo Fender didn't make any one-piece bodies to avoid warping, but I can't remember. My Strat is a American Fat Strat Texas Special in Shoreline gold, if you're bored and want to further look into the part number for the body. Mark Wybierala wrote: If someone puts an instrument into the hot trunk of a car, I have no compassion. Treat a musical instrument just as you would treat a puppy. Cruel people gotta pay me for work and I show no mercy. I 100% understand. I will say though that while of course no one should ever leave a guitar in a car, there is something comforting in knowing that my block of wood would stay a block of wood should the unthinkable happen.